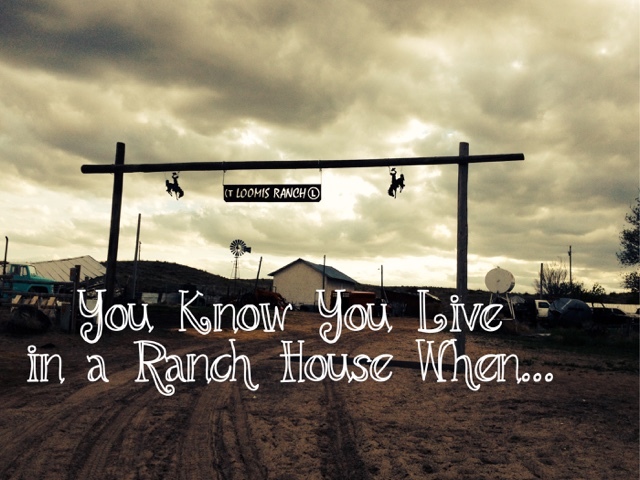 From The BlogA Sunday Thought The Blog Circle L Ranch You Know You Live in a Ranch House When…. A little collection of ranch house notes. 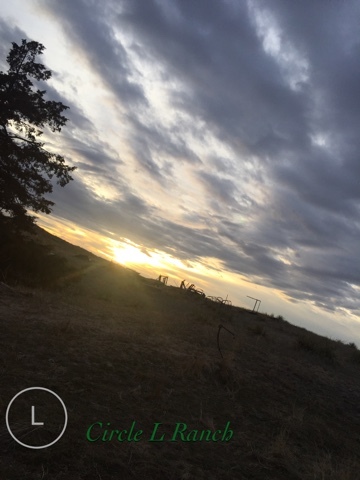 The other night while winding down after a long day, I was thinking about our ranch house. You see, we moved into the Circle L Ranch house about 7 years ago when Cody’s parents retired. This ranch house is our home, and now a part of the story of who we are and a large collection of all the things we love. After talking to our older generation neighbors, we have come to the conclusion that this ranch house was built before 1910. Our house was a 1 room homestead. The previous owners then added a larger kitchen, a couple of bedrooms and an upstairs. In 1965, Cody’s parents, Fred and Darlene, bought the Circle L Ranch and in 1979 Cody’s parents added on a living room, bedroom, bathroom and a laundry room. Cody’s parents raised 5 kids in this ranch house. I came up with a few lines about living in a ranch house. You Know You Live in a Ranch House When……………..
You can only run a few appliances/ electronics at once. We are pros at knowing what will flip the breaker. Even with updated wires, this ranch house can only handle so much. If we flip the breaker, we have to run over a hill to flip it back on. Your bathtub also serves as a calf warmer and dog bathtub. It also has seen more sand, mud and manure than most houses in its lifetime. Your refrigerator has 2 shelves/drawers full of vaccinations/ medicine for cattle, dogs and horses. Yep, you read that right. Vaccine and medications for all our animals is important for us to have on hand at all times. Your laundry room also serves as a vet room. Our laundry room is pretty big, it has a shower, a huge sink, a washer, a dryer and large shelves. This room doesn’t only hold dirty and clean clothes, but you can find all vet supplies needed to treat a sick cow or calf, bandage a sore on a horse, animal ID tags, and the list goes on and on. We make sure that we have all the necessities we need because it takes a vet at least an hour to come to the ranch. Your washer has washed more than clothes. I will just leave that right there!!! You have fresh air EVERYDAY! I mean really, think about all the drafts of fresh air that we get. When Cody and I moved in, we had new windows put in and even though these windows helped with a lot of the drafts, it didn’t stop them all. Let’s just say when the wind blows so do our curtains. Your entry way look like the Calvary came for a visit. I counted them this morning and we have 30 pairs of boots in the entry way. 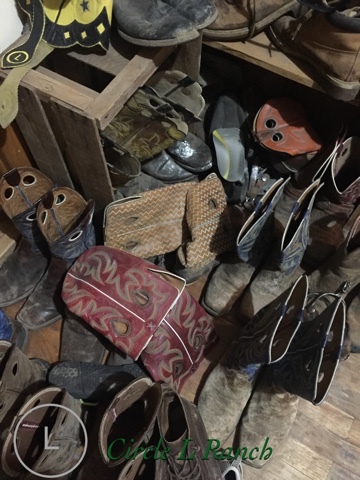 Whether we need Cowboy boots or Bog Boots, they are ready to go!! Your fireplace has a place for a wood box. No, not a box for wood, but a box for a cold calf. Your kitchen sink washes more than dishes. For example, calf bottles, calving equipment, dirty kids, etc. Don’t worry, that’s why Clorox was invented. Your mud room really has mud in it. And NO I don’t clean it everyday. Your floors have the creaks. No really, it is one of the things that I love about ranch houses is the creaking floor. You can hear the kids coming when they get out of their beds. You have a floor furnace. Actually I love the floor furnace. It is very convenient to warm your cold feet and dry wet clothes. Your house has a cellar. Every old house that I know has a cellar and it is servers as a weather shelter and for food storage. I am thankful to have it. Your electrical outlets are only 2 pronged. This is probably one of the things that drive me up the wall, all appliances need 3 pronged outlets. Let me tell you, it is frustrating! Your front door is the original wood door. That is all. Our door is heavy and made right and I like it. Isn’t this a good view? Iron on the hill. Your lawn ornaments consist of old rusted machinery. Let’s just say that we have a stock pile of iron. Your sewer is just a pipe line to a row of old trees. Our ranch house does have a septic tank which was put in when Cody’s parents added on, but the rest of the house just has a pipe. The good news is that when we have a back up, all we have to do is go dig the dirt away from the pipe. Your back door serves as the door to the gun safe. Yes, there are guns by the front door, back door and everywhere in between. Your walls are insulated with old Levis and Western Shirts! Yes, you read that right. Back when this house was built insulation consisted of old shirts and jeans. Our walls still have them in it. We put insulation on top of them to help. We also found old newspapers packed in the walls. We left them. 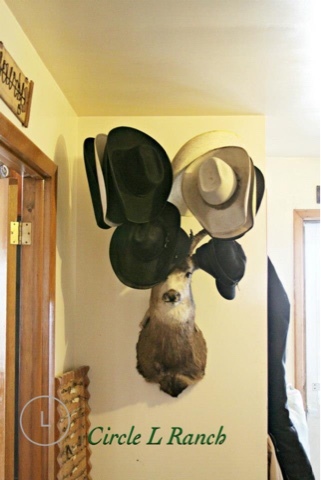 Your hat rack is a prized buck. I will leave it at this: Check the photo out!! Your floors are hard wood. Living in the Sandhills, I appreciate our hard wood floors. Fresh air is the best to dry laundry and I know ours has been drying clothes since the 1900! Your cook stove is gas. This is one of the most important items in our ranch house. This is handy when the power is out, we can still have a home cooked supper and boil water if we need to. Our ranch house is made with beams, walls and lots of stories. 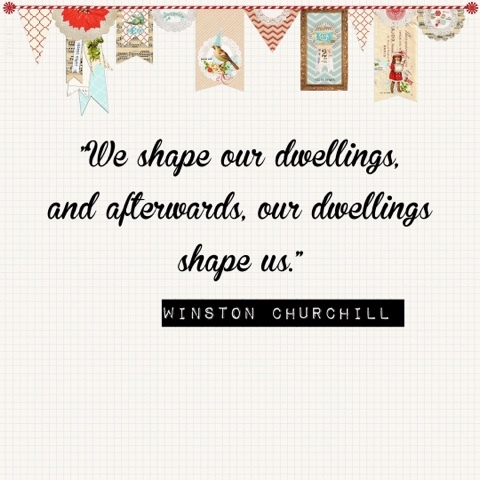 The form of ranch houses never matters as much as what goes inside – because those are the people and special things that transform any space into a home. Ranch houses not only house and protect people from the elements, but they tell a story, express a person or family’s interests and make guests feel welcome. Ranch houses are originals and they all have character. You are welcome to come visit our ranch house anytime.